For those who think that Kerala's scenic beauty is just meant for relaxing the tired soul, here is a piece of surprise. Kerala is a happening destination amongst the lovers of adventure. As an adventure destination, Kerala, offers its visitors umpteen opportunities to unleash their enthusiastic self. The high mountains, gushing river, dense forests and the vast stretches of ocean water present just the right destination to let go the hesitation and indulge in some really exciting activities. 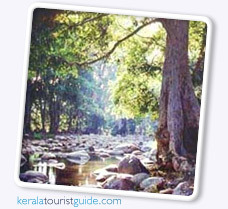 Tourists interested in becoming a bit adventurous, therefore, will have plenty to rejoice about when they reach Kerala. From water sports to wildlife tour, choices are plain and abundant. Kerala is home to some of the most well known wildlife sanctuaries of the country. Animals, birds and reptiles that inhabit these sanctuaries are a varied lot and offer a wildlife aficionado a joy that they cannot forget in their life. With mountains around, it is quiet obvious that trekking is one of the prime adventure option in Kerala. With loads of beauty around trekking becomes all the more enjoyable in the hilly regions of Kerala. With a large number of lakes, lagoons, canals, estuaries and rivers (forty-four), Kerala is a heaven for backwater cruising. Adventure freaks can board houseboats, also known as Kettuvalam, and sail through the serene waters exploring the far flung regions of Kerala. The rivers, lagoons, lakes, canals and sea water in Kerala also allow for other water sports like Canoeing, Catamaran Sailing, Kayaking, Para Sailing, Scuba Diving, Snorkeling and Wind Surfing. Chinnar Wildlife Sanctuary is located 18 km north of Marayoor in Kerala in South India. It is contiguous with Eravikulam National Park to the south, Indira Gandhi Wildlife Sanctuary to the northwest and Kodaikanal Wildlife Sanctuary to the east Many species of Mammals including Indian Elephant, Gaur, Panther, Spotted deer, Sambar, Common langur, Bonnet Macaque, Hanuman monkey, rare Nilgiri Tahr, White Bison and Grizzled Giant Squirrel. Many species of birds and reptiles including the largest population of Mugger Crocodiles in Kerala, and many species of amphibians and fishes live in the Sanctuary.